Praise the lord, festival season is finally upon us, and if you're worried about skincare then you need not be! Just keep reading! If you're anything like my younger self, then you'll probably just grab a pack of wet wipes and be done with it but if you were to ever need a decent skin care routine, it's probably going to be when you're covered in mud, glitter, spilt alcohol and suncream/rain/sweat ( the list really could go on.. couldn't it) Now then, I'm not suggesting that you pack your entire skincare and makeup selection into suitcases to take with you as I'm well aware of how completely unpractical that would be. However, by planning ahead and making a few minimal changes, you might leave that festival with better skin than when you arrived! Pack on that SPF : Gone are the days when I used to dread suncream as it would stay white and sticky for hours and enter a whole new appreciation for protecting my skin from those dangerous UV rays. I'm all about getting that tan on but if you're heading to any festivals this summer, you're likely to be out and about for days on end and that can really play havoc with your skin. Also.. a peeling nose is SO not instagramable. Priorities please. Ideally you're looking for something lightweight and non-greasy that you'll only have to apply once in the morning so go for something in the factor 50's and job's a goodun'. Cleanse properly: If you're using facewipes you'll probably only be taking off one of the hundred layers of grime/glitter that have built up over the day/night and then proceeding to dry your skin out ready for a nicely irritated blotchy face (Just me? No, didn't think so.) Get your hands on a travel size gentle cleanser that doesn't require bucket loads of water to do its thang (enter the Kiehl's ultra facial cleanser), grab yourself a face cloth or flannel and a bottle of water and you're good to go! Go light with your base: Nobody wants a face caked full of foundation, contour, powder, bronzer, blush etcetcetc when you've got a busy day ahead doing what this festival thing is all about: drinking. Haha I'm kidding.. but seriously.. you want to be able to let loose whilst listening to your favourite bands without worrying that your face is about to melt off. So, get yourself involved with a tinted moisturiser or skin perfector and you won't have to worry about your new face slipping off of your real face. Time to recover: If you've been watching my videos over on my youtube channel then you'll know I'm a fan of the Kiehl's Midnight Recovery Concentrate.. It basically saves my face and leaves me waking up with smoother, clearer and more radiant skin : just what I'm about. The great thing about this product or those that are similar is that they take minimal effort and give maximal results! (Something else that I'm totally about.. especially when I've got more important things to worry about like who's feet are in my face in a significantly overcrowded 2-man tent). You can literally just apply it before you head off to sleep and my morning you'll feel renewed and refreshed.. well.. your skin will at least, I can't promise the same for your head. 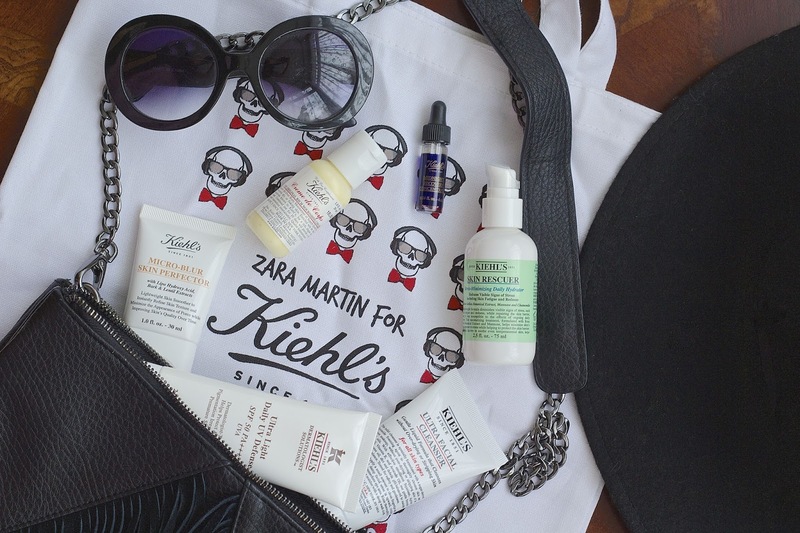 If you're looking for 'do it all' kinda purchase then you might want to check out Kiehl's who have partnered with Zara Martin to create the ultimate festival survival kit. It includes many of their holy grail products in a travel perfect size and can we please just appreciate how frigging CUTE that tiny Recovery Concentrate bottle is? The products will last you easily through a few festivals and probably longer as a little really does go a long way with every single product included. I can't really pick a favourite as I'm in love with them all but I've been testing out the Micro Blur Skin Perfector since it arrived on my doorstep a few weeks ago and I dig it. A lot. If you purchase this little bag of absolute babein' goodies then you'll also get the limited edition tote bag which is great because A) It's got skulls on it and B) You can use it to carry round your necessities which may or may not include flower headbands and face glitter. I'm not here to judge. I'm hoping to take my kit along to The Great Escape festival in Brighton which would be ideal for many reasons: one of which being that Brighton is my favourite place in the entire world so there's that. Have you got any festivals planned this Summer? Obviously Coachella is always the goal but for now, I'm more than happy to listen to some sweet music and soak up the rays with my pals. That mini Micro Perfector is so cute - what a great kit! I'm definitely favouring the 'sit in the sun with pals and music' option - very cheap. Heard so many great things about Kiehl's! I'm planning on going to Kaboo Del Mar in southern California this September! Sunscreen is definitely so clutch for music festivals. I especially love the aerosol kind because then you don't even have to worry about rubbing it in! Great post! Ohhh wow that'll be amazing!!! Yesss the aerosol is a great shout!! So quick and easy, no fuss! These sound like incredible products, I always struggle with what to take to festivals. My poor face! I'm planning Benicassim - the festival survival kit looks ace!